Biryani! Does that word invoke the feelings of mouth-watering comfort and joy? Yes, we all love this indulged, aromatic, rice delicacy. 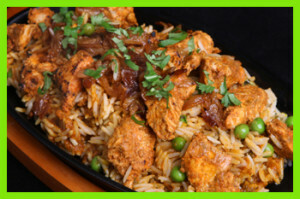 Today it is a very special recipe, the Hyderabadi Chicken Biryani. I know it’s your all time favourite. The Arabic, Iranian, Mughals and Turkish food influence this delicious Indian dish using plenty of spices, wheat and rice. On the whole, I love the mixture of herbs and spices carrying the mint aroma that whiff all over the house when you are cooking the Biryani. First, soak rice in water about 30 minutes, then drain it and set aside. As well, dip the saffron strands in hot milk and set it aside. Immerse the chicken with the prepared marination ingredients and keep it aside about 30 minutes. Heat water to cook rice. Add oil, mace, black cardamoms, green cardamoms, cinnamon stick, cloves, bay leaves, peppercorn, shahi jeera and lastly salt. Boil the water for about five minutes. Add the rice which soaked in water before and cook it. Rice should not become syrupy. Drain off excess water. Put marinated chicken into a deep dish. Add coriander leaves, green chillies, half of the mint, fried onions and pour melted ghee or oil into the dish. Mix all well. Coat the rice evenly and then add fried onions, coriander leaves and mint. Sprinkle some biryani masala. Repeat the previous step. Now drizzle saffron milk on top of the rice. Wash a cloth and wipe all the leftover water. It has to be only damp. Double layer that cloth and put it on the dish’s mouth and cover with the lid. Place this container above a sizzling tawa and keep the flame medium high letting everything cooks evenly inside the vessel. Cook rice around twenty minutes. Now decrease the flame from medium to very low and let it cook approximately twenty minutes. Once you see the smoke sopping on the wet cloth, close flame leaving it to soothe for about half an hour. Your own Hyderabadi Dum Chicken Biryani is prepared. 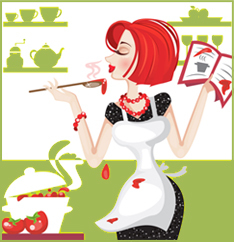 Taste it hot, serve it to your family or visitors, enjoy! Julia Reid is a journalist. She likes to research everything .Julia is an expert of content writing. Always she gives new things for society. These days she is researching about coffee beans and food recipes.